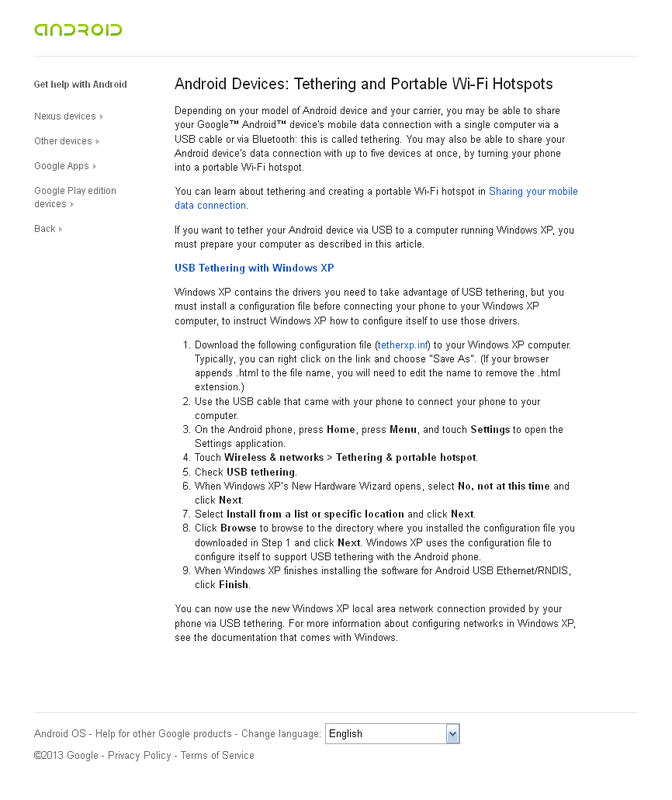 Having USB tethering working on Windows XP using your Nexus device is somewhat different. You will be complained by Windows that the driver is missing and you might get no idea where the hell the driver is. Google actually has a hidden article which provided the link to the driver. I have also captured the screenshot of the webpage and the configuration file below (just copy and paste the content and save as file with file name tetherxp.inf) in case the above link no longer works. ;    full CDC Ethernet support. ; Microsoft only directly supports RNDIS drivers, and bundled them into XP. HKR, , MofImagePath, 0x00020000, "System32\drivers\rndismp.sys"
HKR, Ndi,               Service,        0, "USB_RNDIS"
HKR, Ndi\Interfaces,    UpperRange,     0, "ndis5"
HKR, Ndi\Interfaces,    LowerRange,     0, "ethernet"
HKR, NDI\params\NetworkAddress, type,       0, "edit"
HKR, NDI\params\NetworkAddress, LimitText,  0, "12"
HKR, NDI\params\NetworkAddress, default,    0, " "
HKR, NDI\params\NetworkAddress, optional,   0, "1"
ServiceDisplayName    = "USB Remote NDIS Network Device Driver"
AndroidDevice         = "Android USB Ethernet/RNDIS"
SourceDisk            = "Ethernet/RNDIS Driver Install Disk"